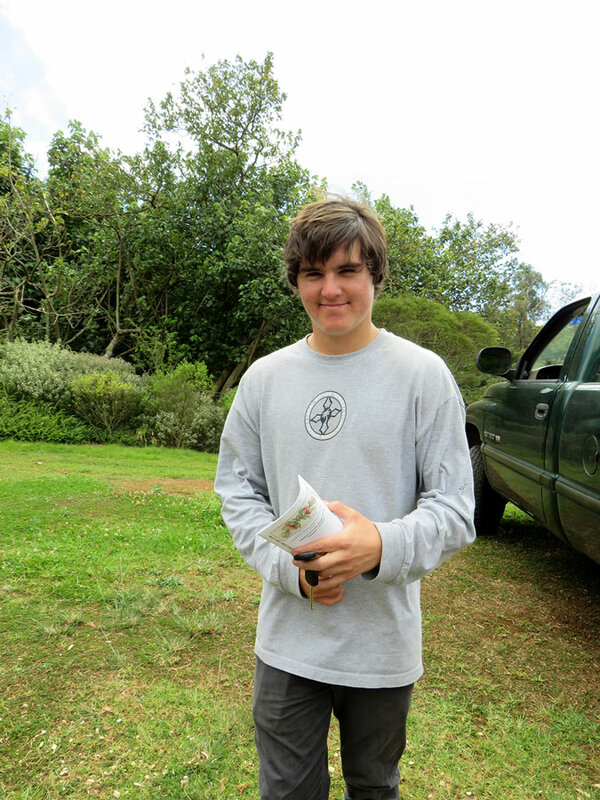 Ulupalakua-Friends of the D.T. 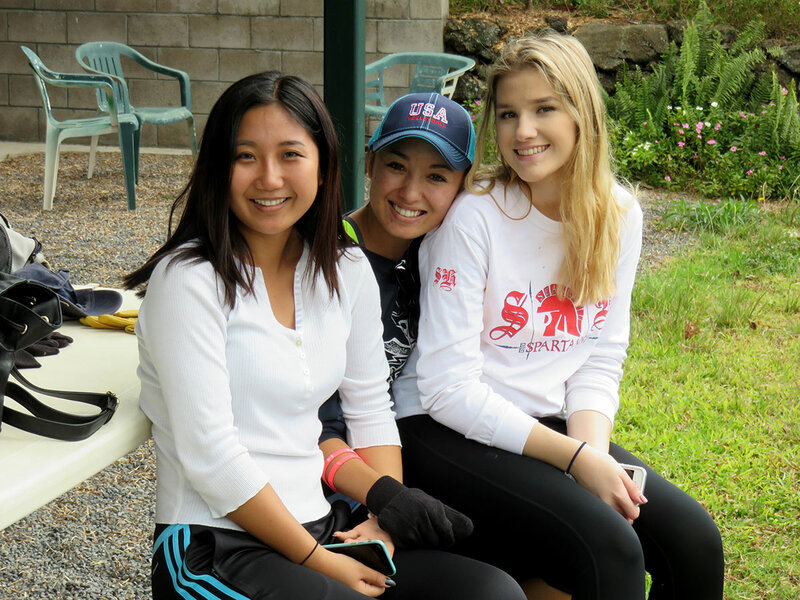 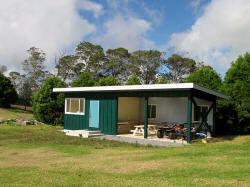 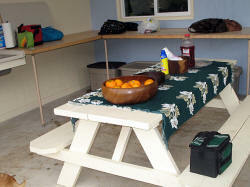 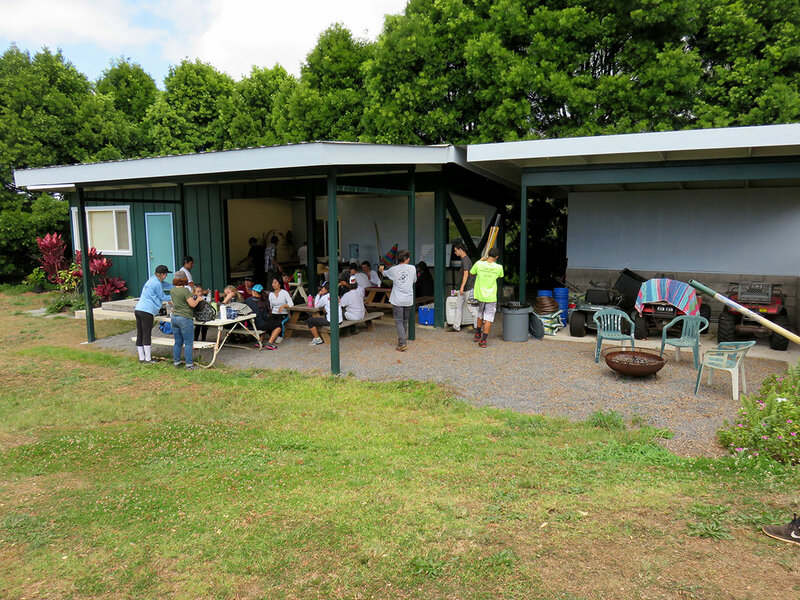 Fleming Arboretum at Pu’u Mahoe hosted a 2 night Camping for Volunteers of Troop 14 of Kula August 10 to 12. 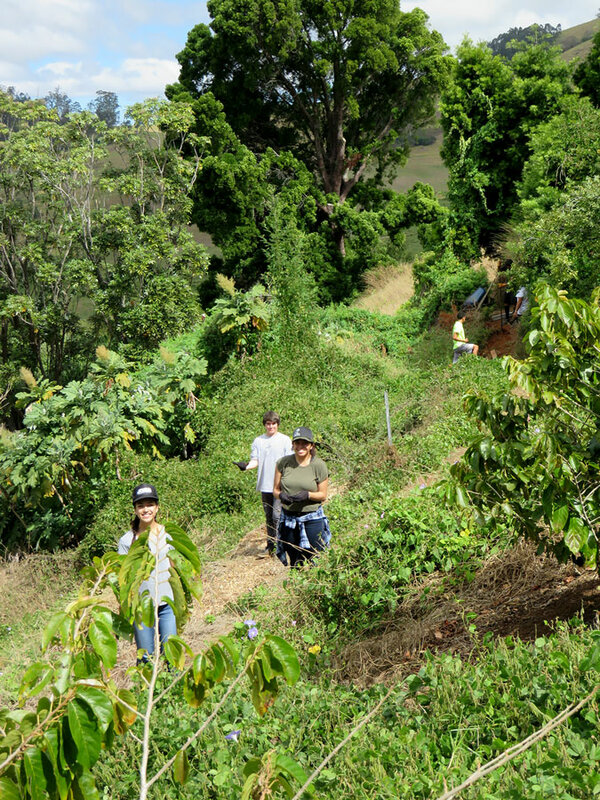 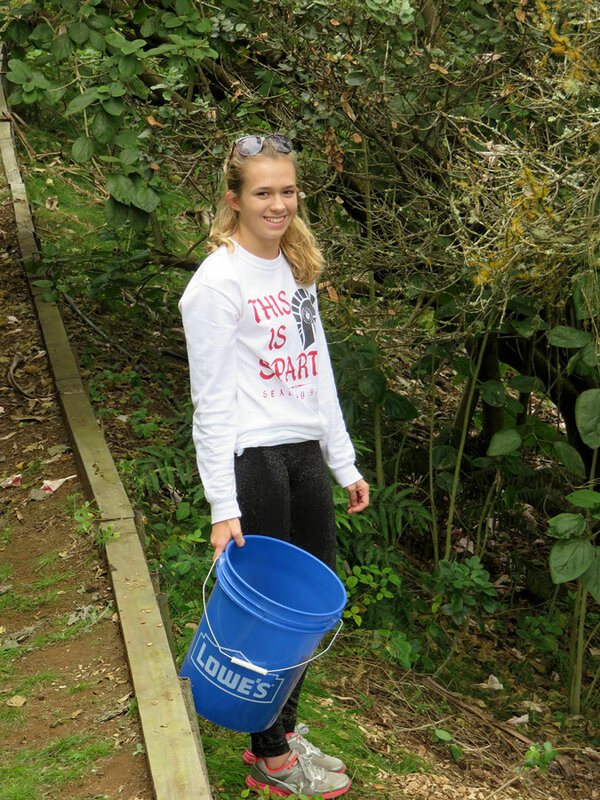 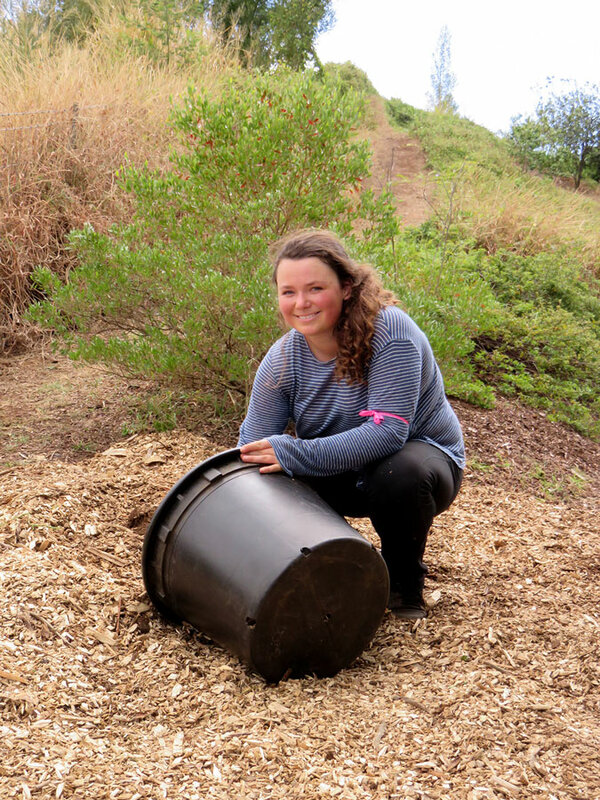 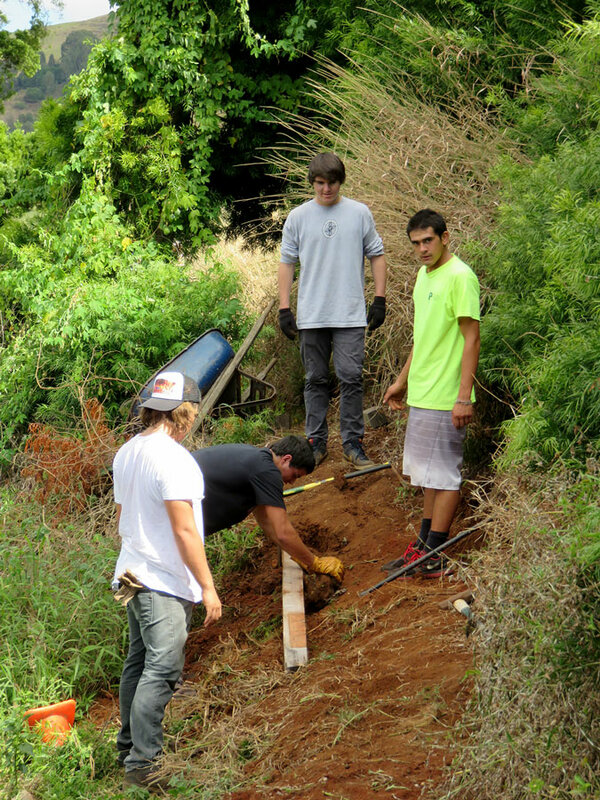 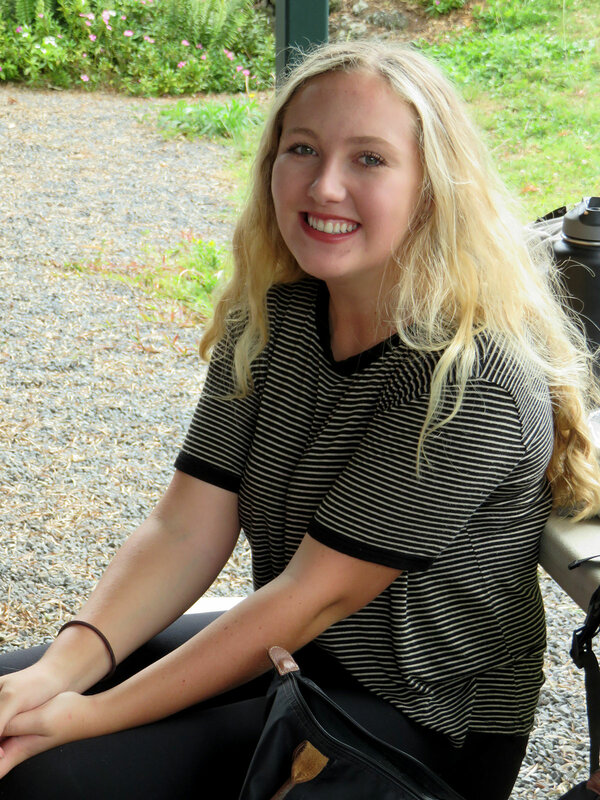 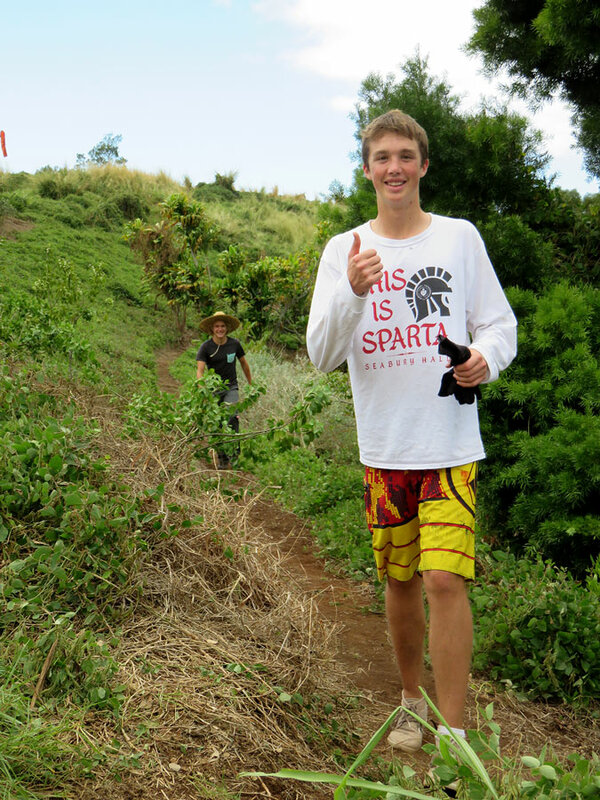 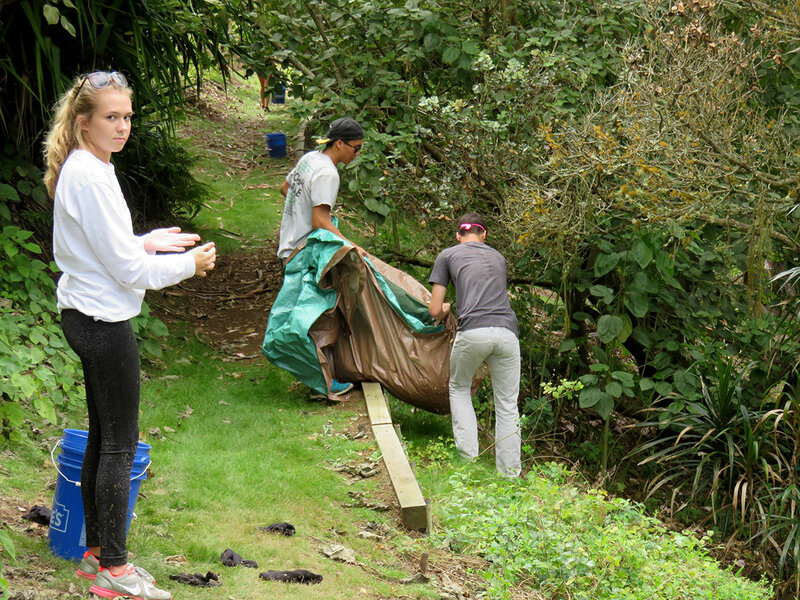 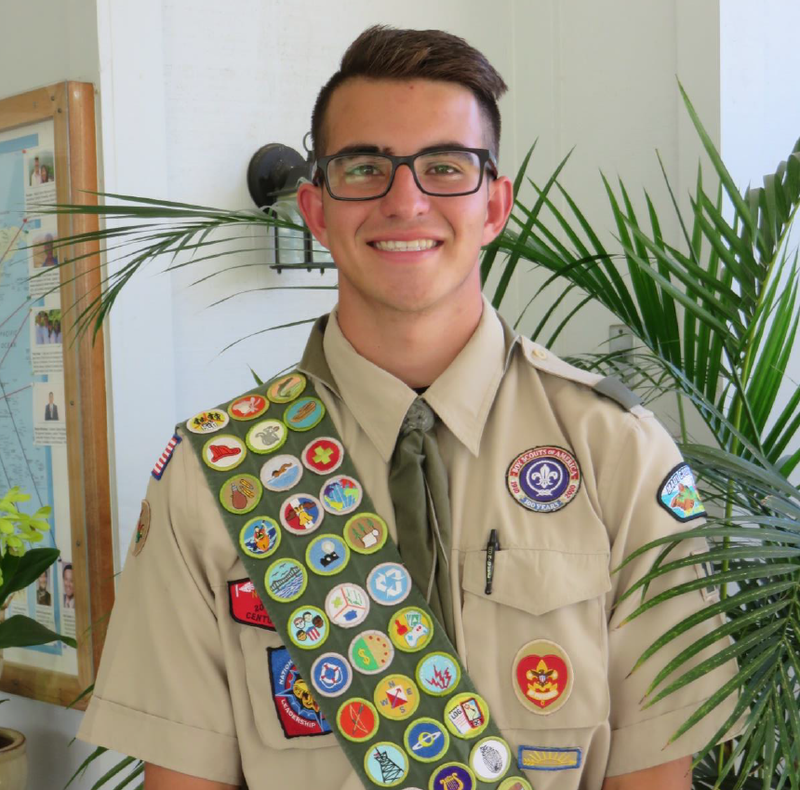 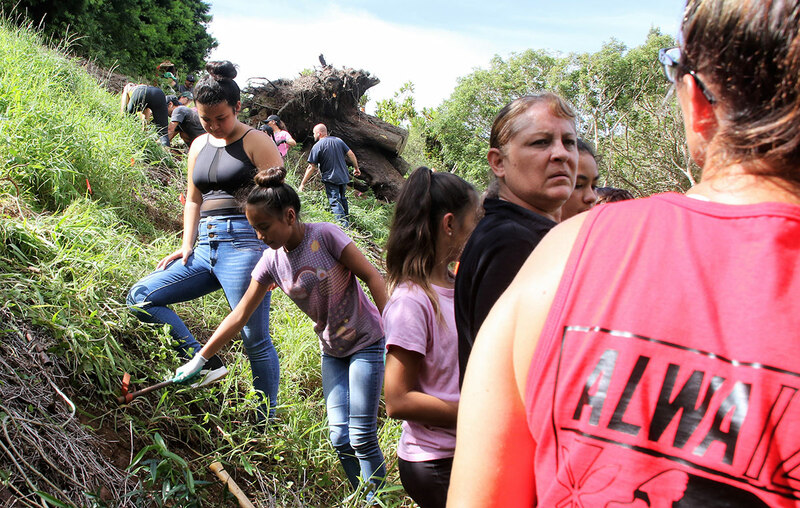 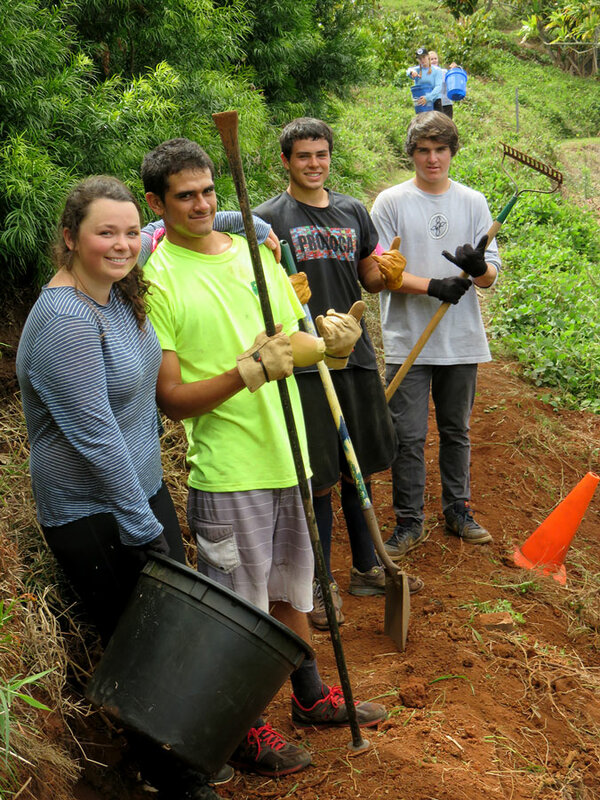 The weekend was organized and directed by Fletcher Prouty, Eagle Scout and junior at Seabury Hall.The Boy Scouts completed the planned weekend service project – the construction of a 300 foot trail to expand native reforestation within Pu’u Mahoe’s cinder cone. 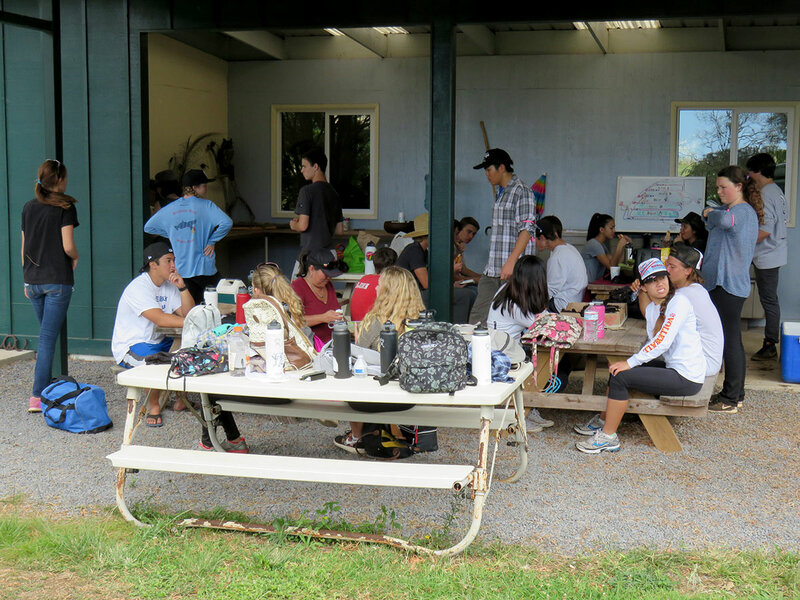 Educational presentations were held throughout the weekend. 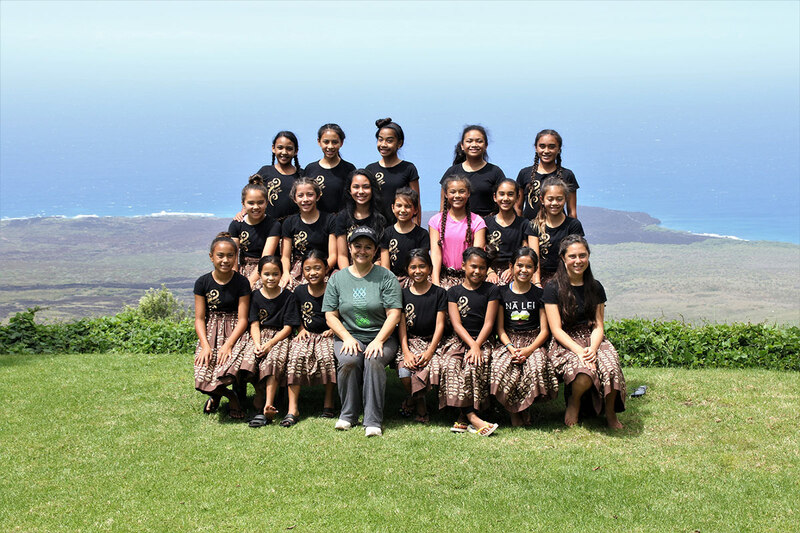 Harriet Witt, astronomy instructor, conducted an evening Star Watch teaching about the stars and other navigational tools of the ancient Hawaiians. 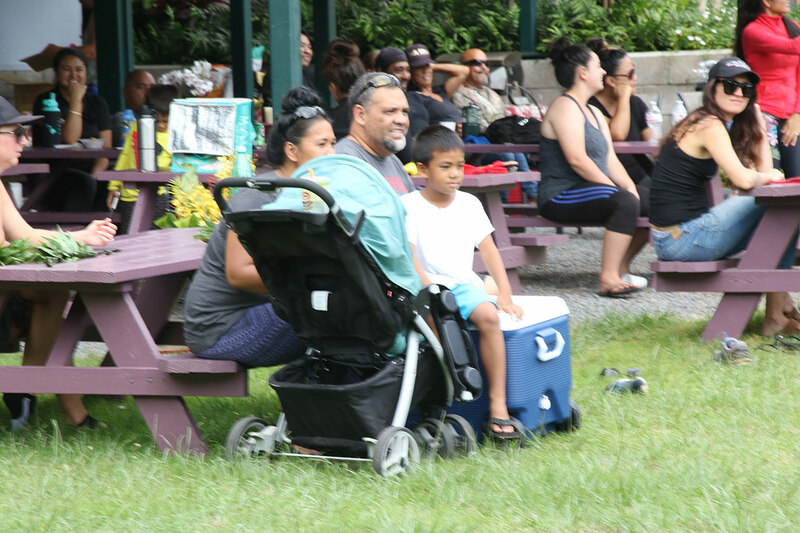 David Grooms, Professor and assistant Dean of Instruction of University of Hawaii Maui College, gave a geology presentation Sunday morning explaining the cinder cones and lava flows of South Maui. 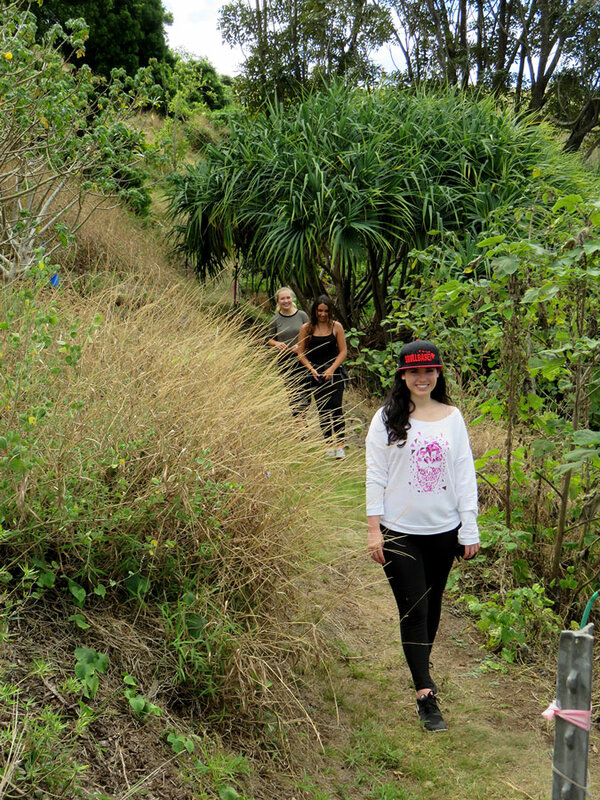 The weekend included a hike to the Hawaiian Rain Alter on Ulupalakua Ranch. 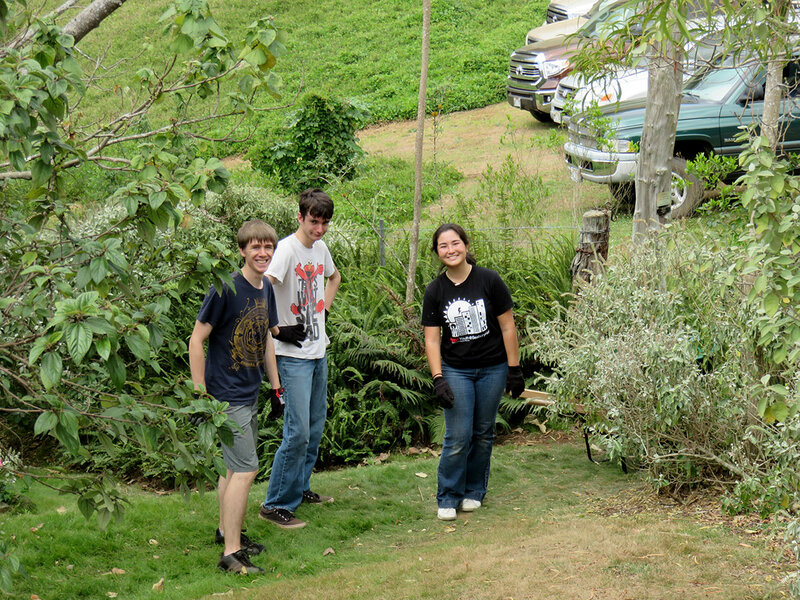 Friends of the D.T. 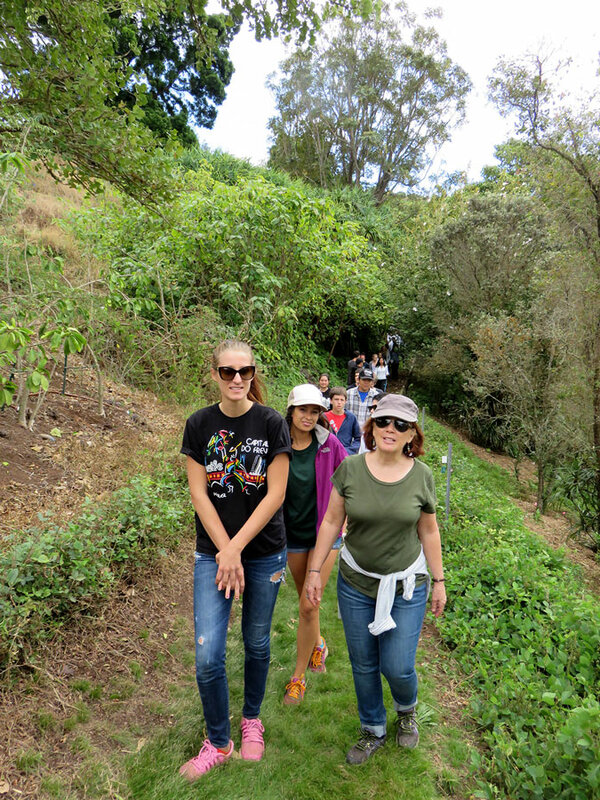 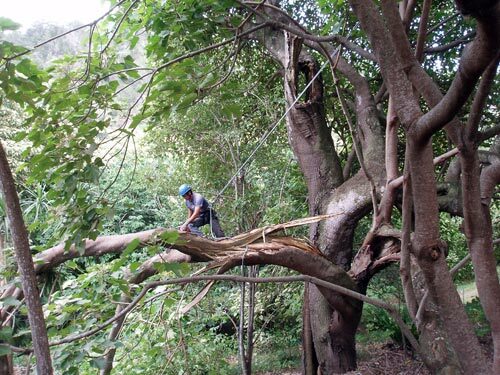 Fleming Arboretum at Pu’u Mahoe (FOFA) was created in 2002 to continue the work and vision of David Thomas Fleming: to preserve Maui’s dry land forest plant species for the restoration of watershed and native habitat on the southern slopes of Haleakala. 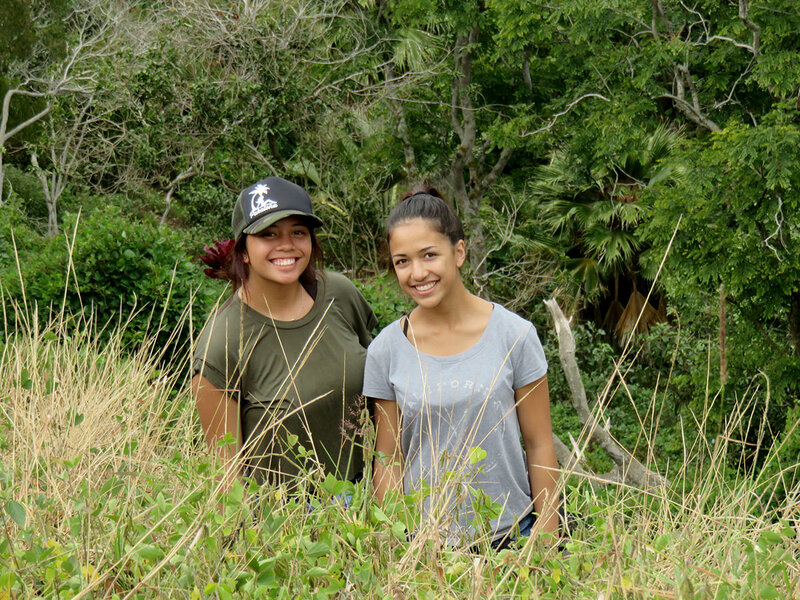 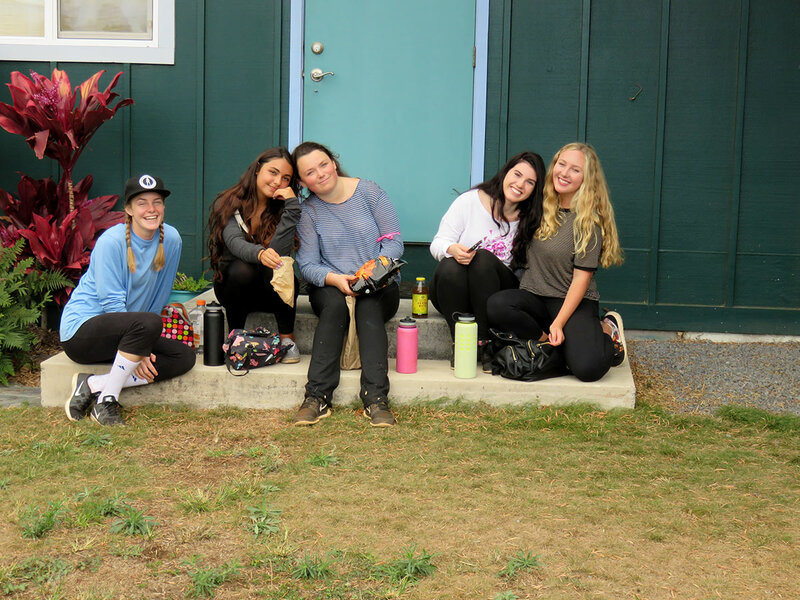 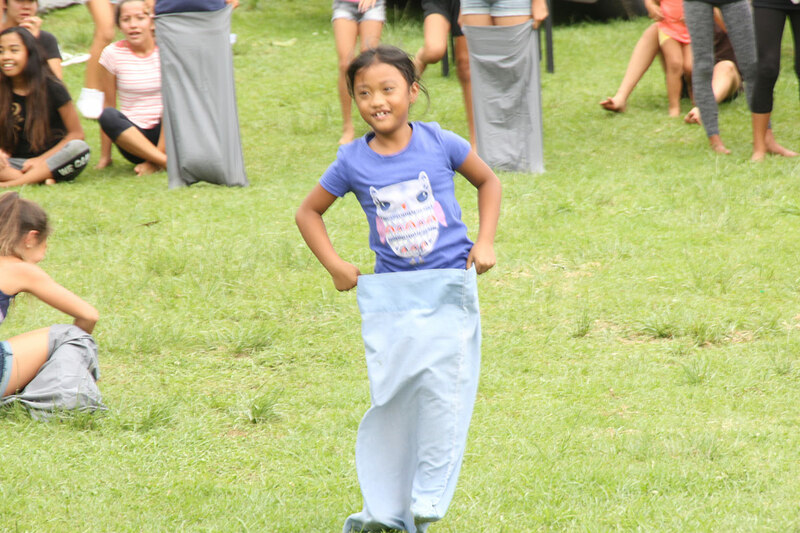 FOFA offers programs in conservation thru education and volunteer opportunities to youth and community groups throughout the year. 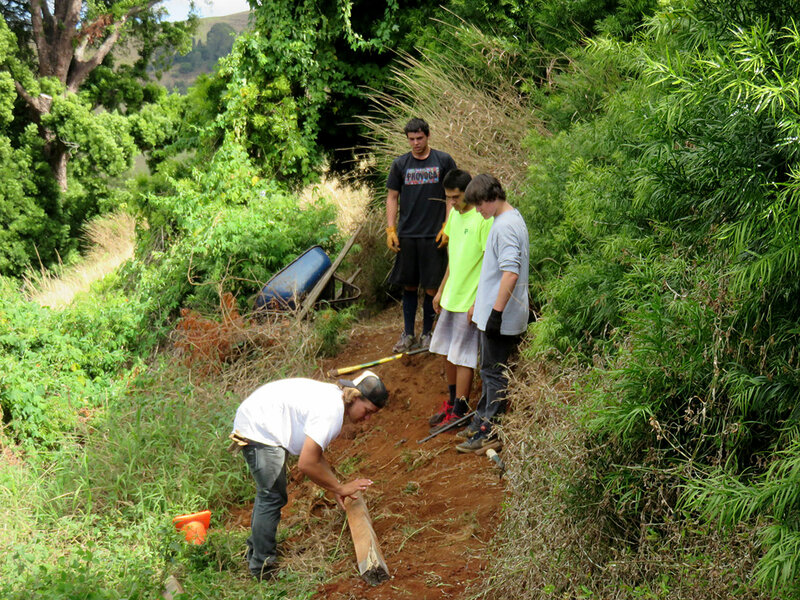 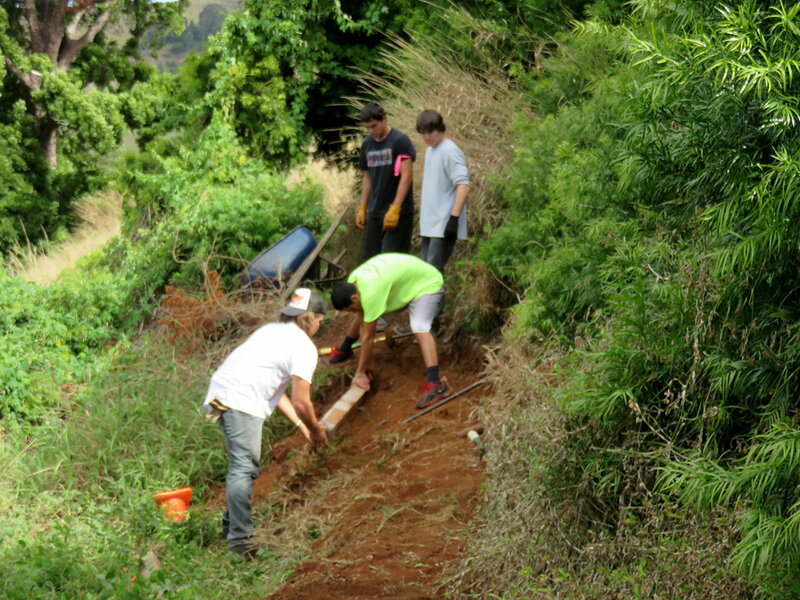 The Scouts learn about proper repose and compaction to prevent erosion while building a 300 foot trail to expand native reforestation within Pu’u Mahoe’s cinder cone. 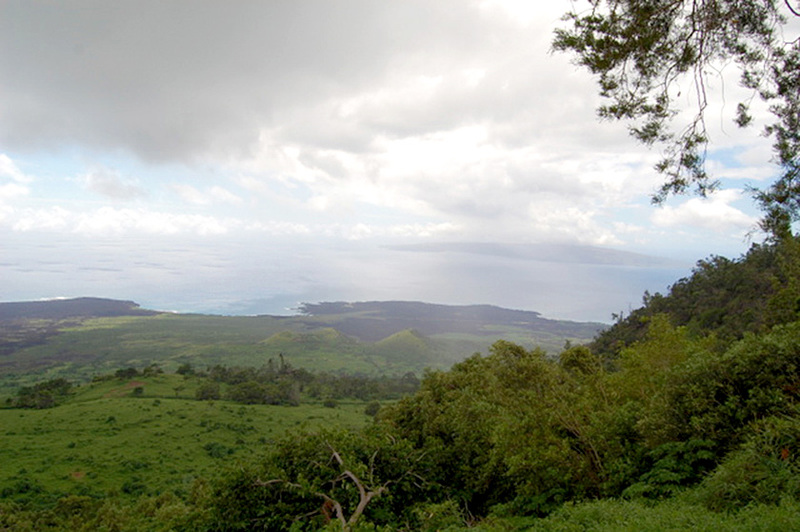 David Grooms points out Pu’u Mahoe cinder cone within Maui’s south rift, a fissure from the hot spot under the island of Hawaii. 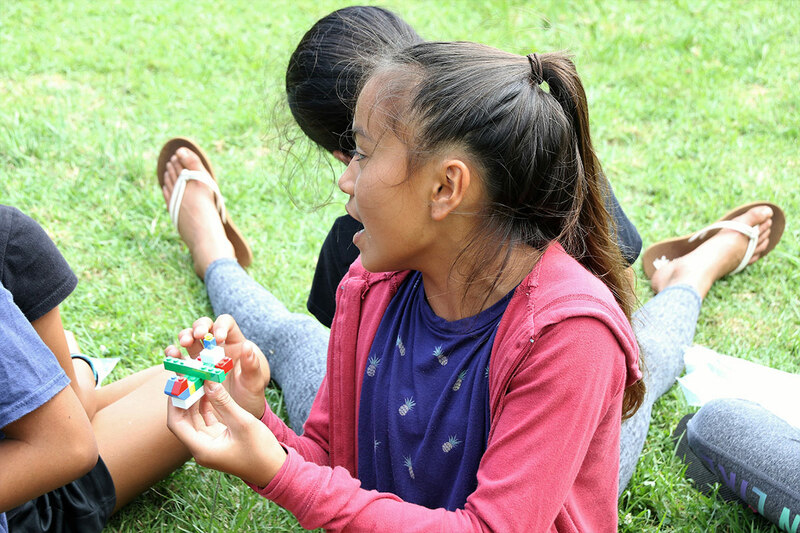 Boy Scout camping includes a carefully lit fire and the traditional evening desert “Someors”- perfectly grilled marshmallows with chocolate inside two graham crackers. 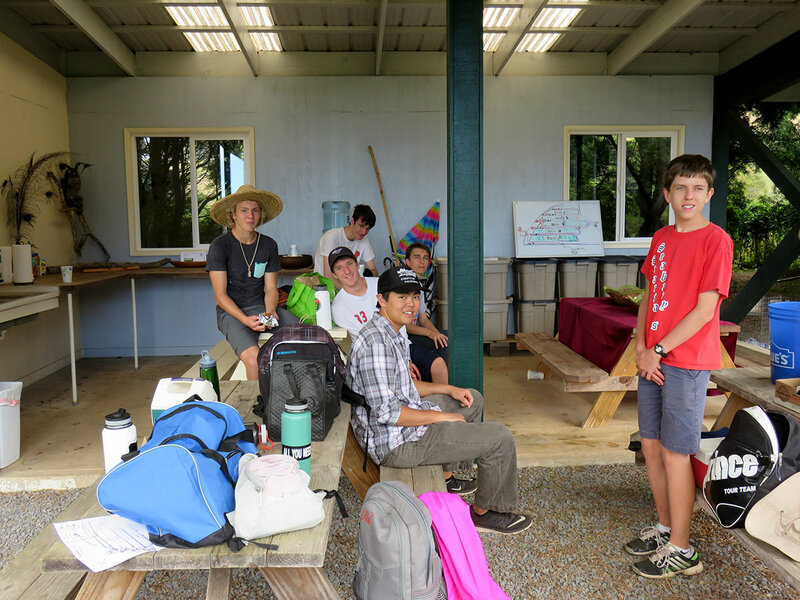 L to R- weekend coordinator Fletcher Prouty, RJ Prouty in black and other scouts of Troop 14. 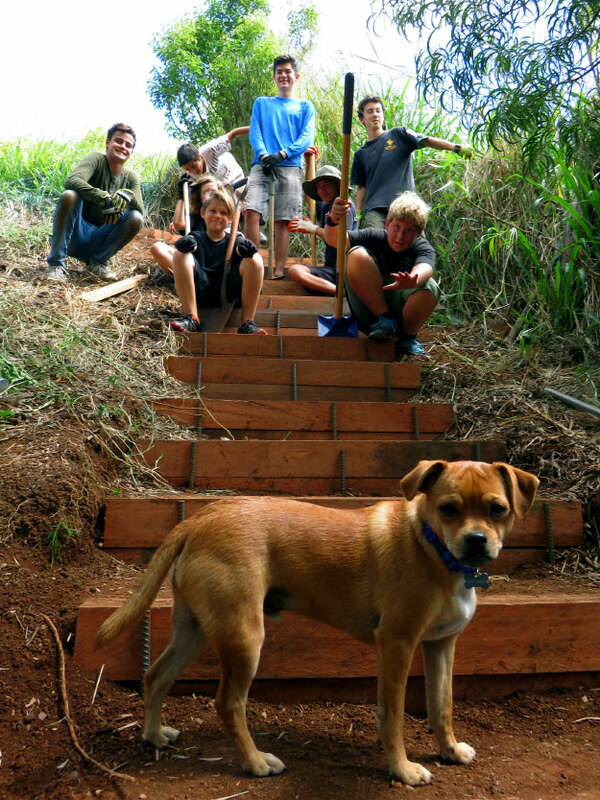 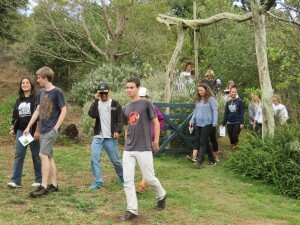 Troop 14 walk their newly completed trail on way to their next project- an afternoon of guinea grass eradication. 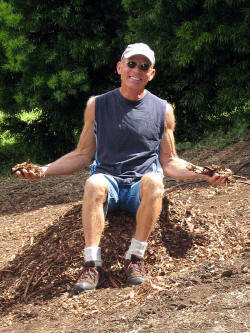 super-hero who distributed mulch to half the arboretum. 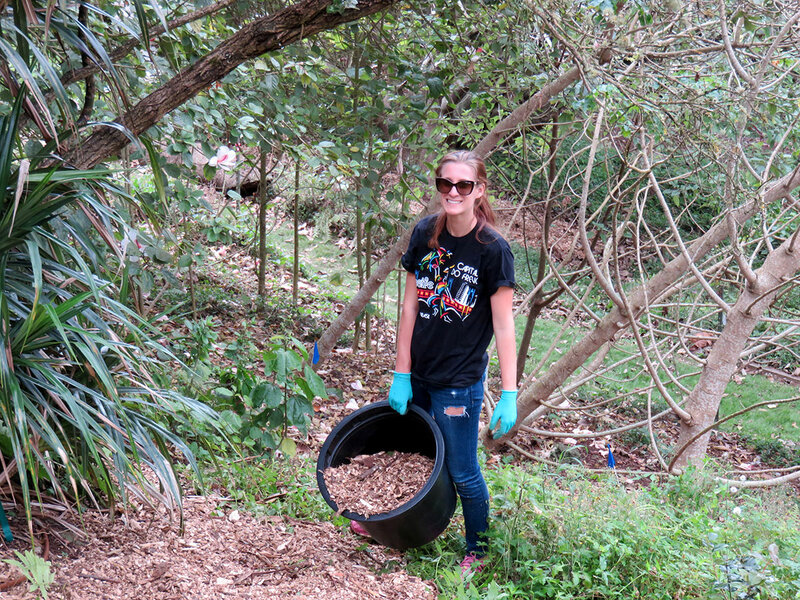 sits on the remaining of 50 yards of mulch. 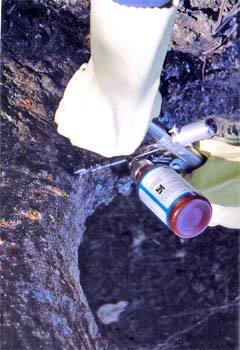 and high nitrogen osmocoat with trace elements was applied first. 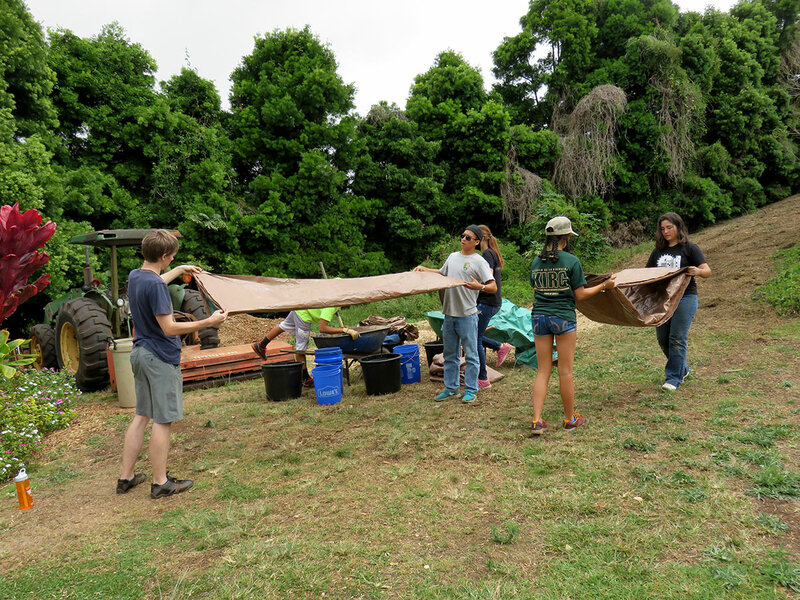 a minimum of 250 native plants and a double row windbreak. 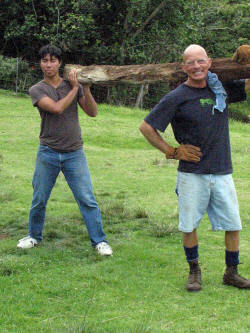 of old Hawai`i, strong for future generations. 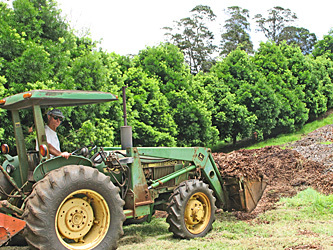 David Moran volunteers tractor & time to spread wood chips on steep area of newly cleared fence line maintenance road- to prevent erosion. 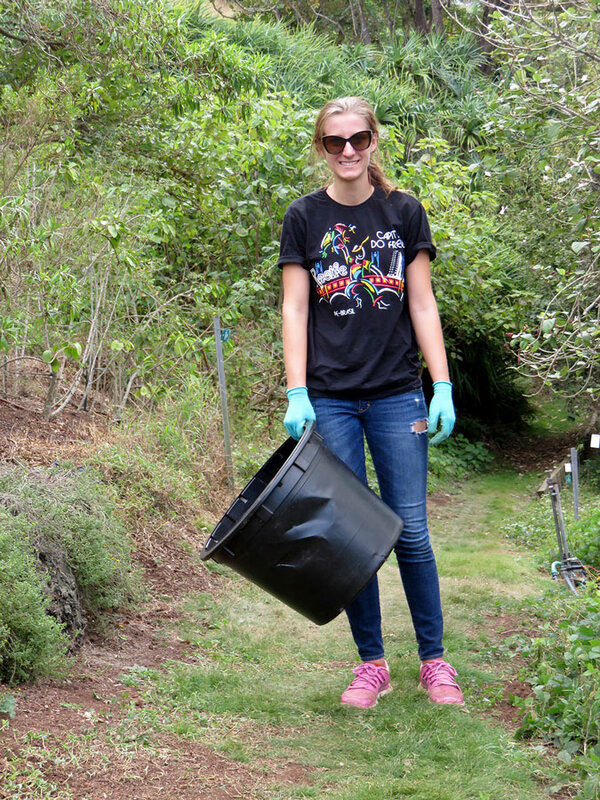 Weed and mow Arboretum trails every 2 weeks. 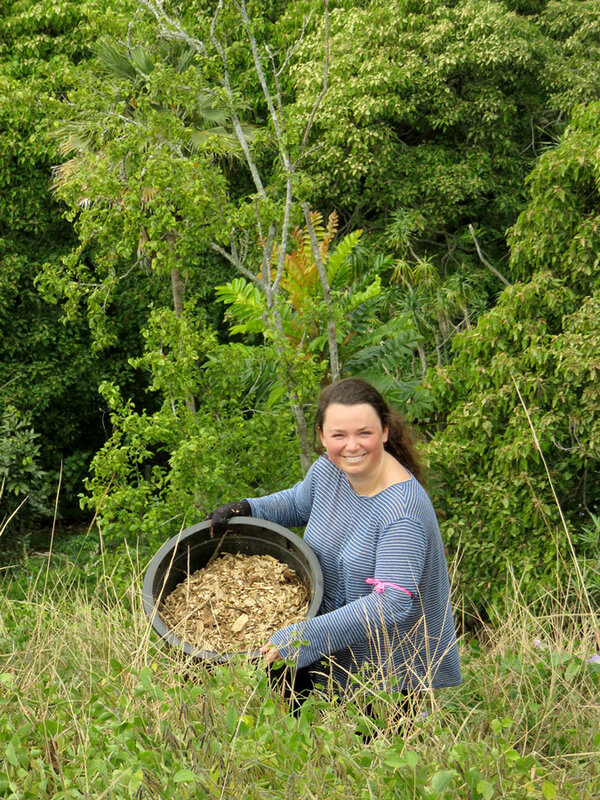 Weed-eat Arboretum blocks once a month. 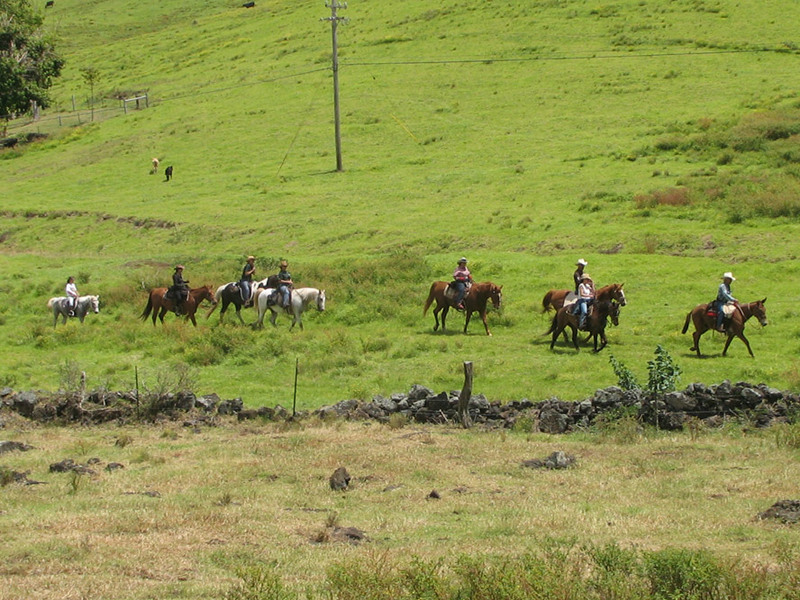 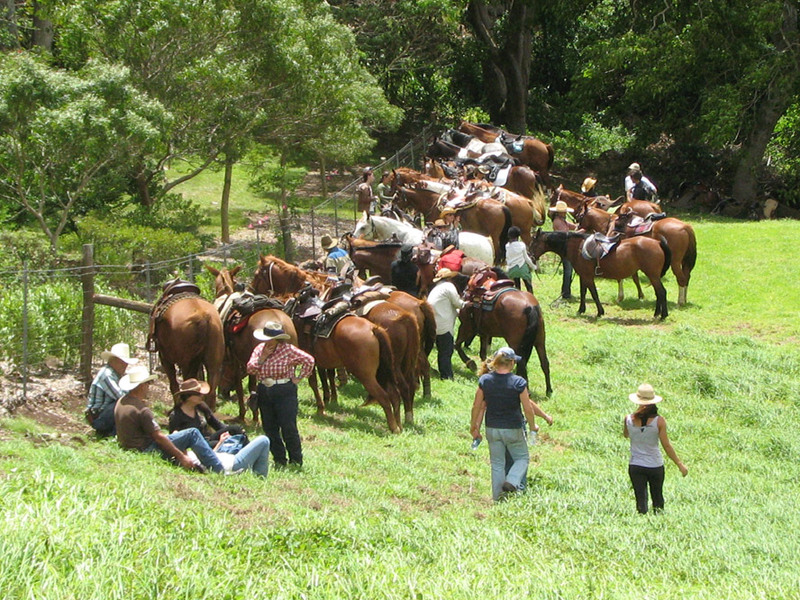 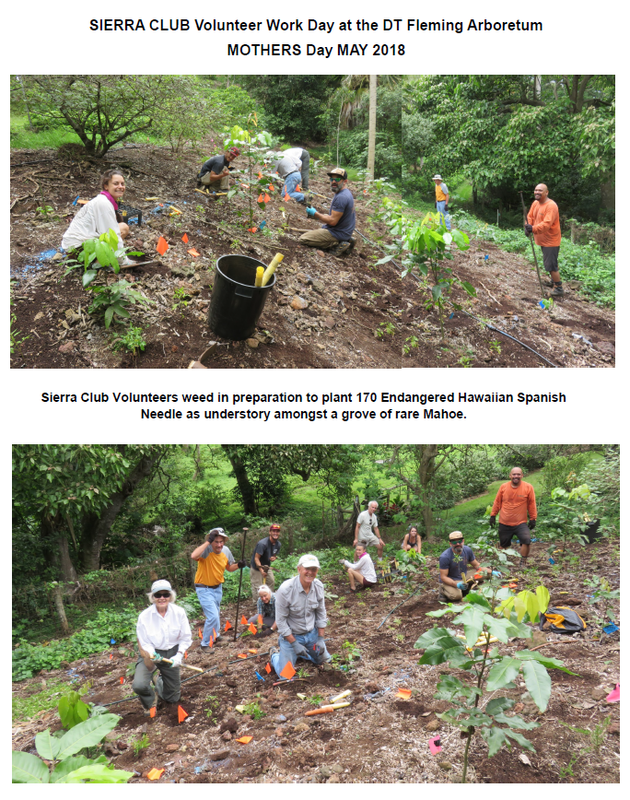 Selective broadleaf herbicide control at Pu’u Mahoe property [Arboretum not included]. 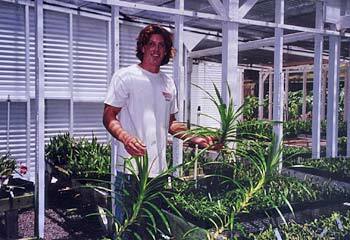 Care of nursery seedlings for winter Arboretum out planting. 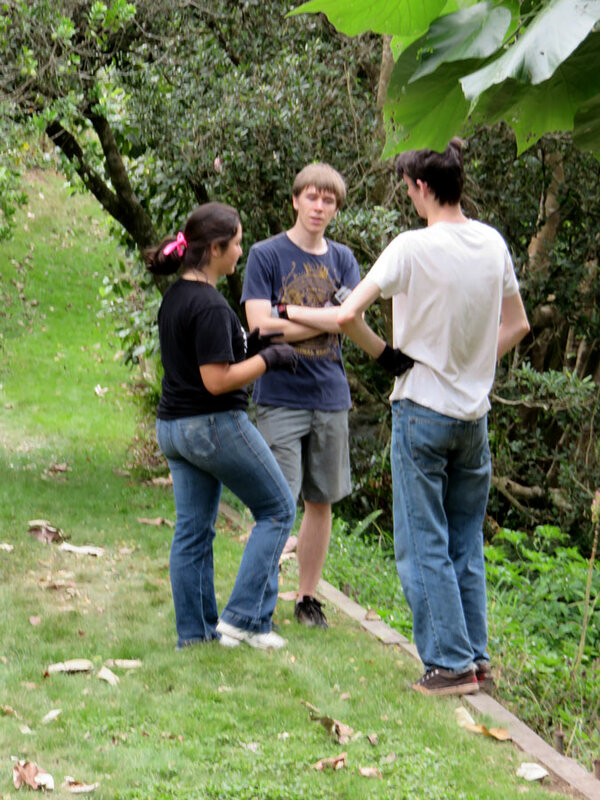 Arboretum tours the last Saturday of every month. 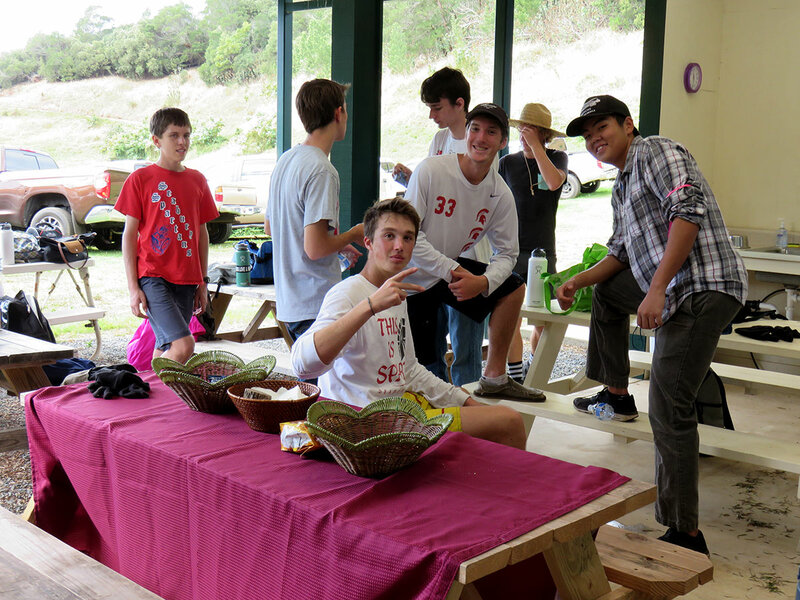 Special community and school events as requested. 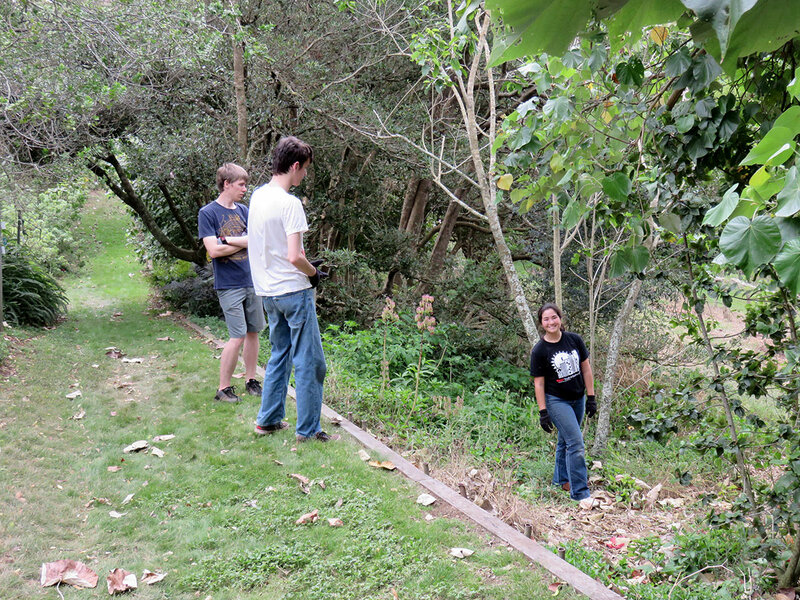 Volunteer workdays the second Saturday of every month. 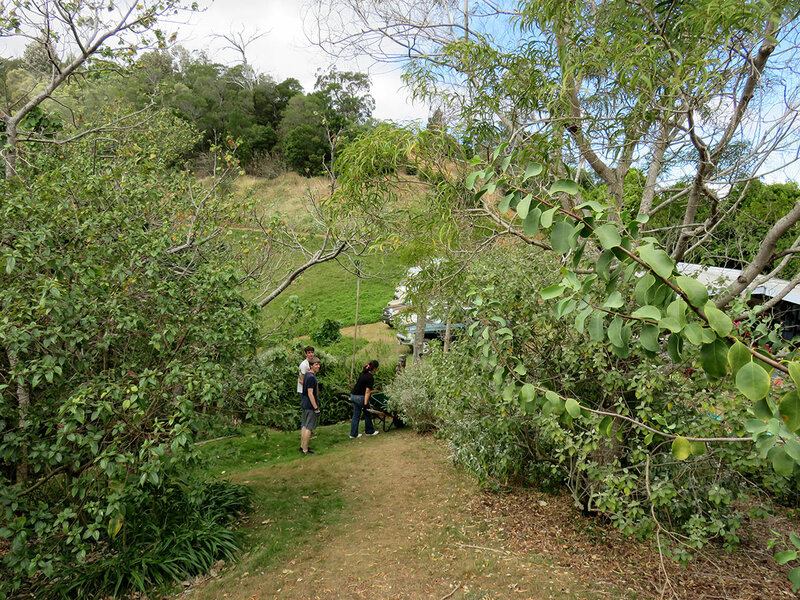 as Arboretum basic maintenance and FOFA’s operating costs. 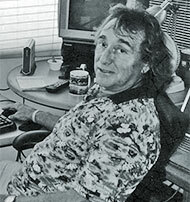 Terry Nutt – upper left). 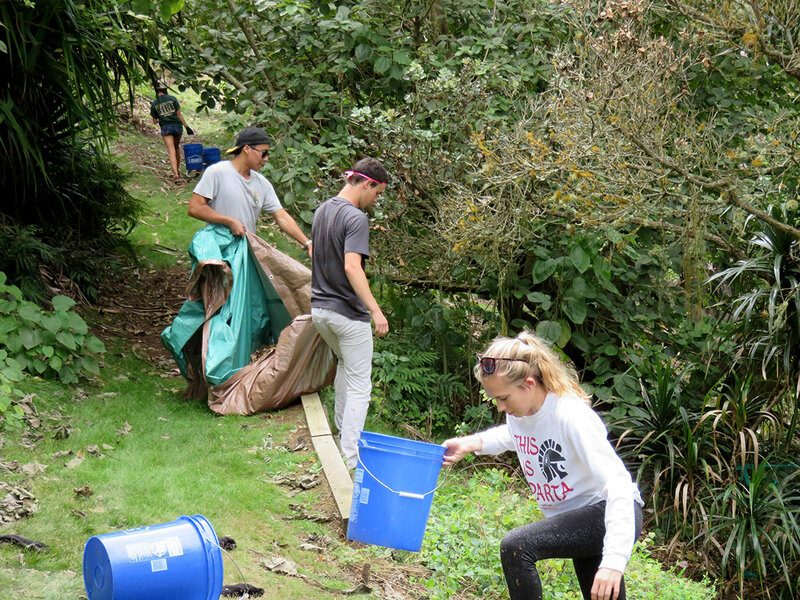 individual donations and volunteer time. 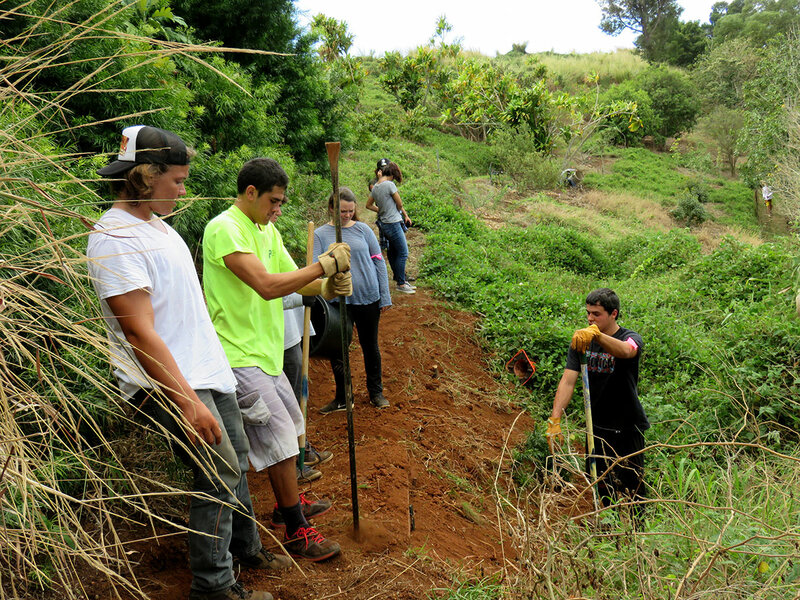 With available funding, the Arboretum progresses. 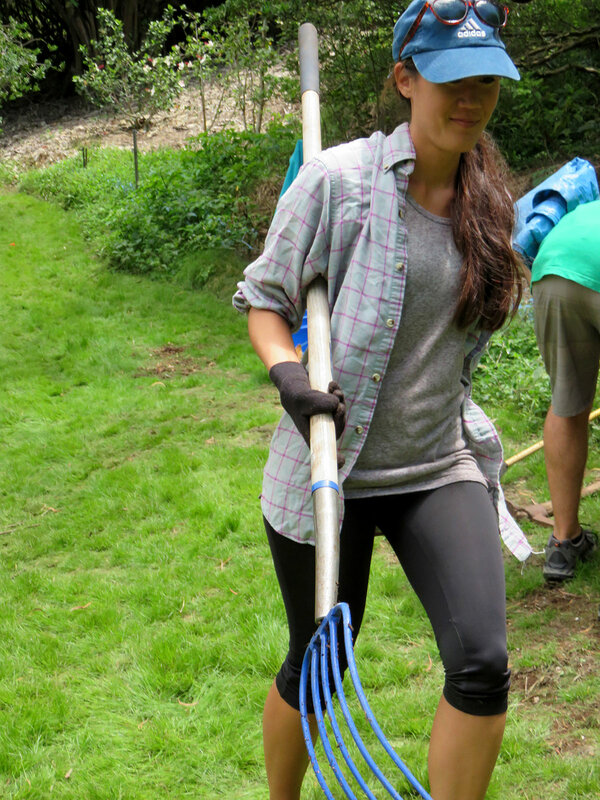 no longer be difficult for a mower or hikers. 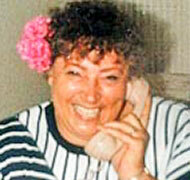 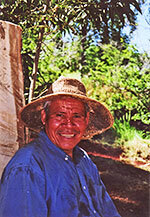 Queddeng,Kaunoa Senior Center Activity Director. 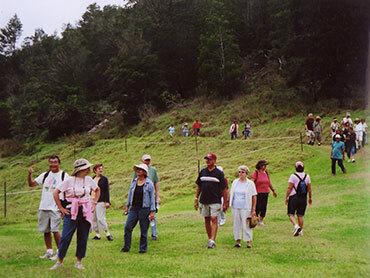 Arboretum Tour in 2007, led by a volunteer tour guide. 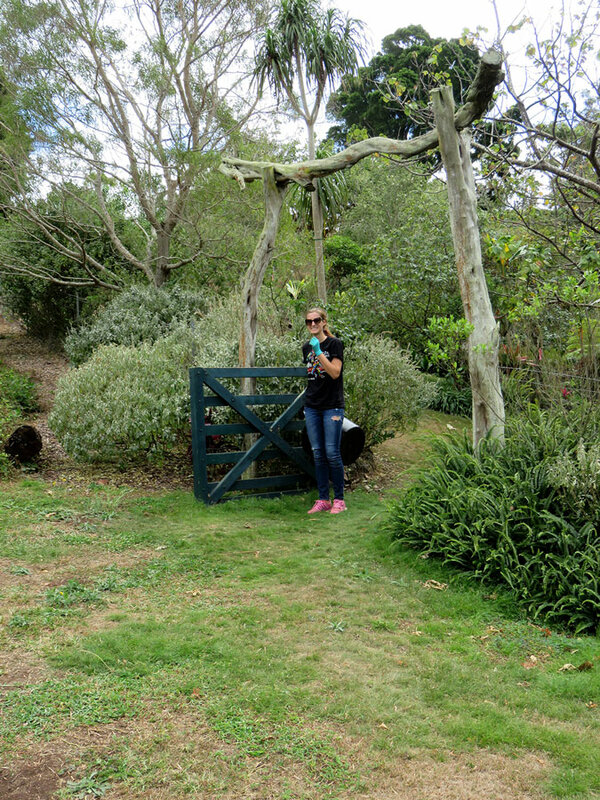 fencing, they can not get into the Arboretum. 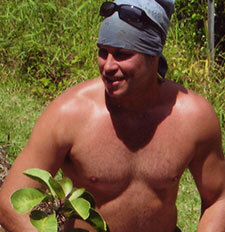 here for Donors List). 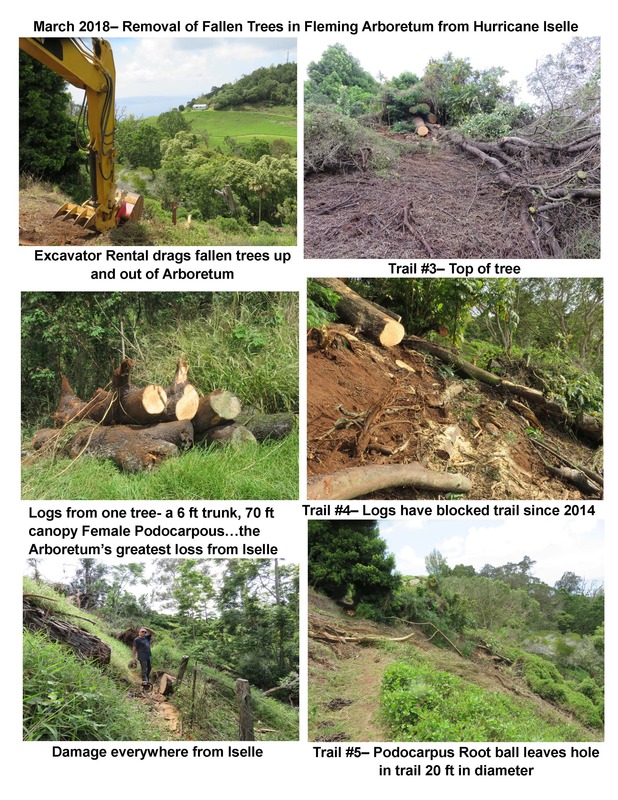 The following are some of the projects supported by donations. 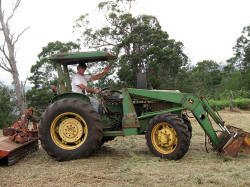 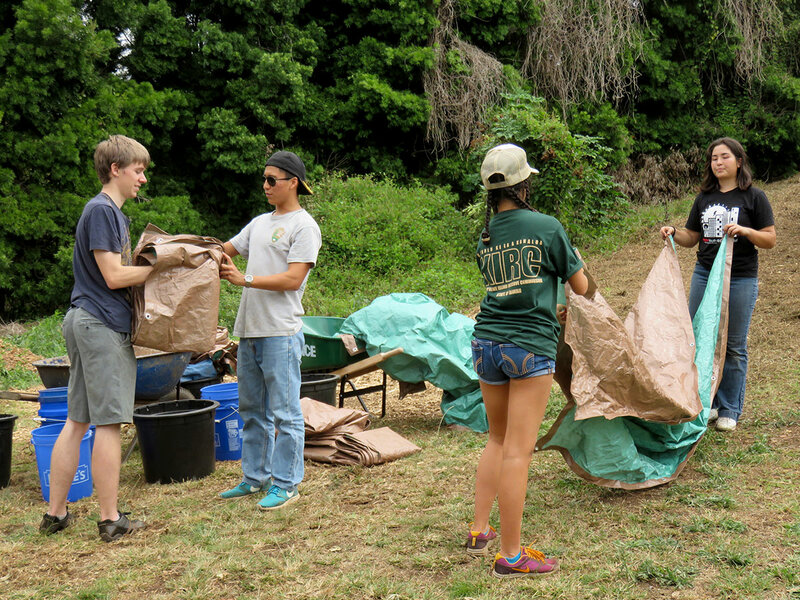 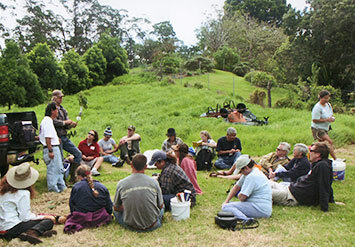 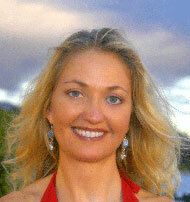 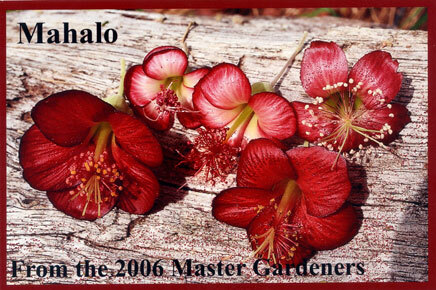 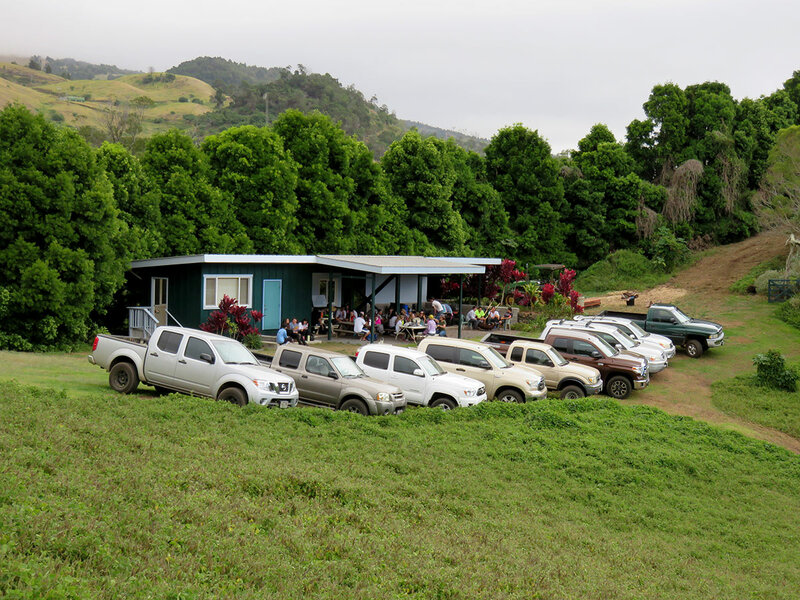 Annual propagation workshops include the community in preservation of Maui’s dryland species. 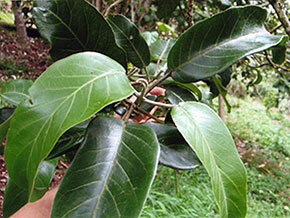 Airlayering and grafting skills are learned to encourage propagation and distribution of these species. 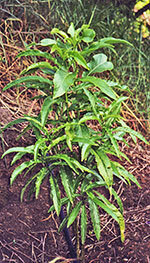 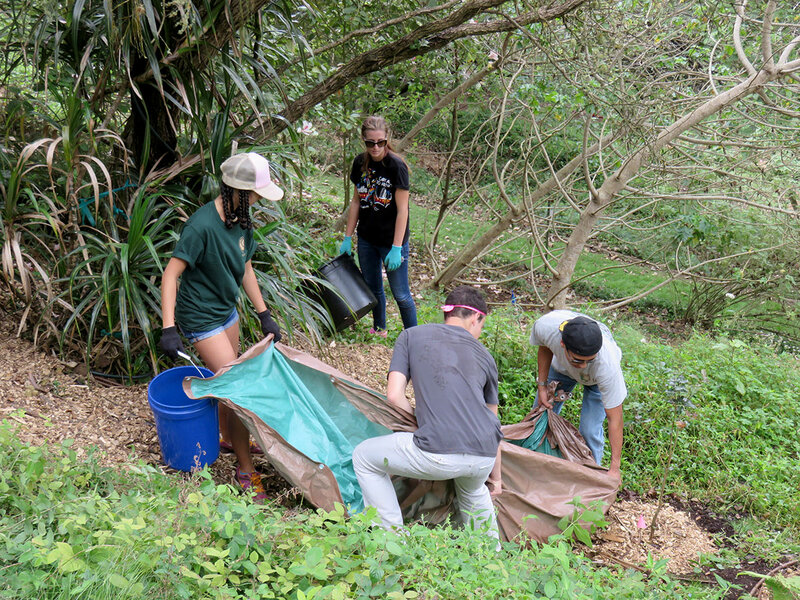 The endangered Hibiscus hannerae and the most fragrant Hibiscus waimeae are propagated to be outplanted within the community. 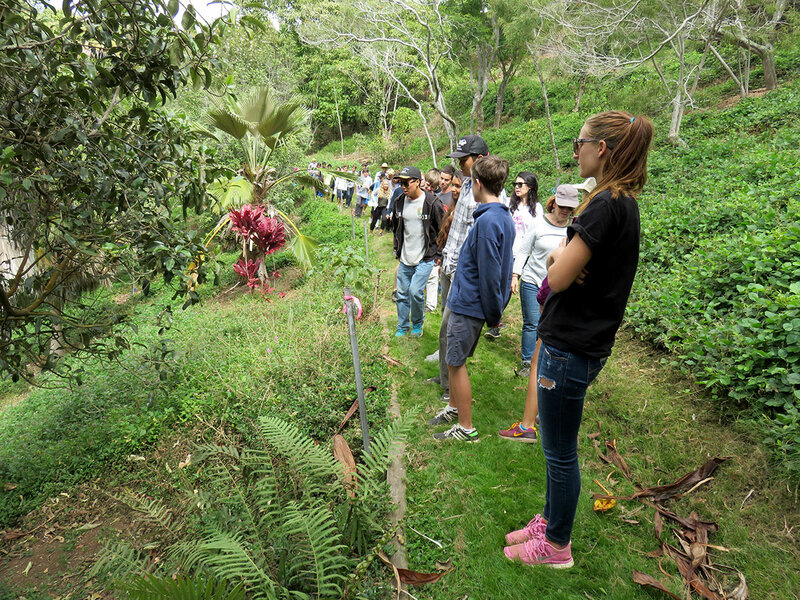 Propagation workshops fulfill FOFA’s mission of preservation through protection, propagation and distribution. 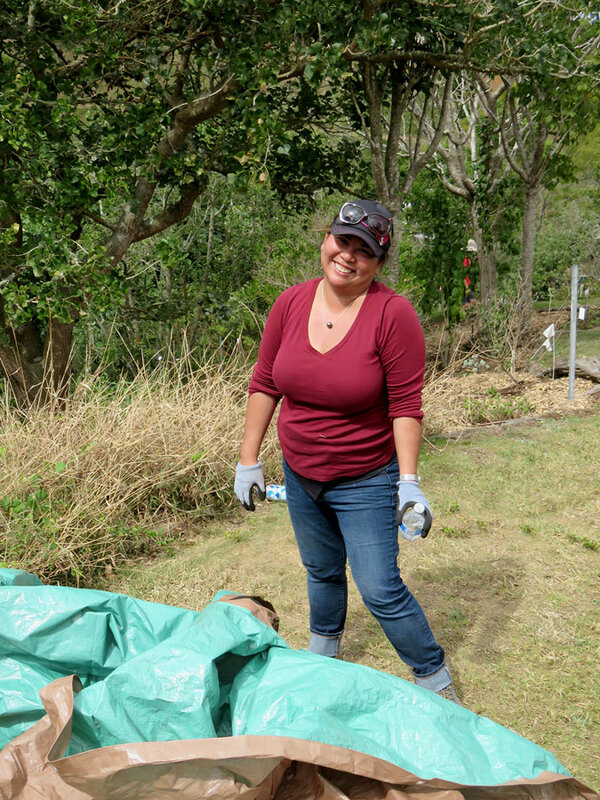 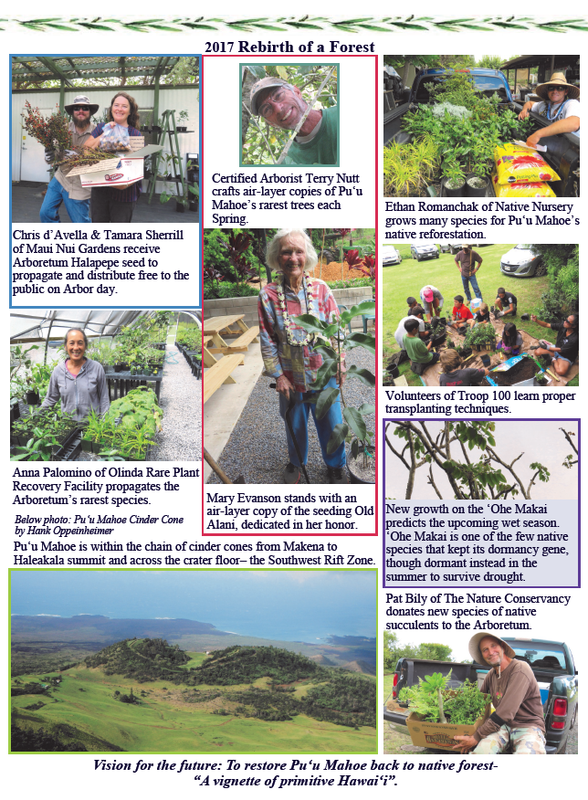 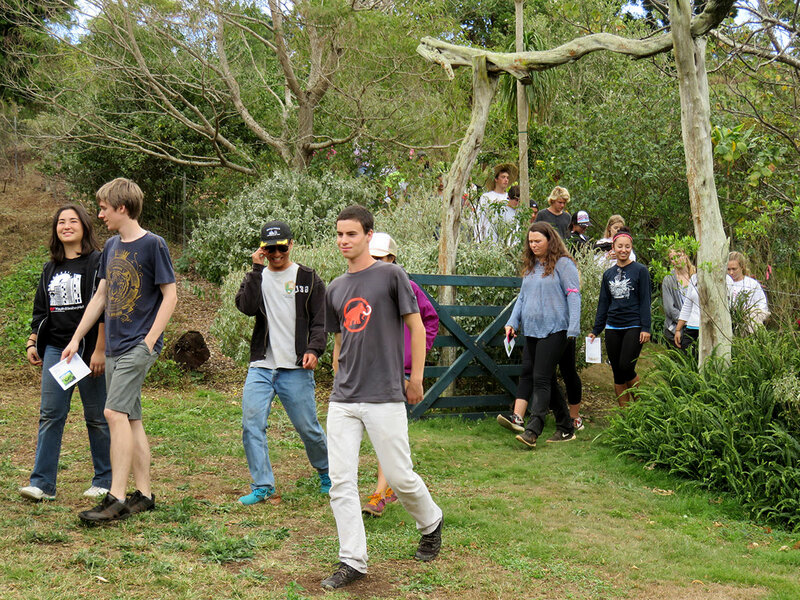 FOFA’s propagation workshops included students from 2006 Maui Master Gardeners, Nature Conservancy, Maui Nui Gardens and Haleakala National Park. 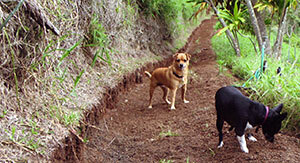 Hog wire aprons were installed along lower trail of Arboretum to keep out baby pigs. 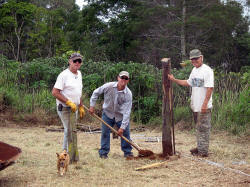 Fencing was installed by Terry Quisenberry and Henrick Lyons (Maggie Moran stand-in). 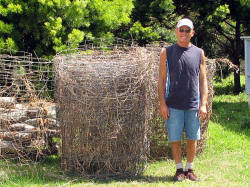 A pig trap has been loaned by Tyler Thompson of Ululpalakua. 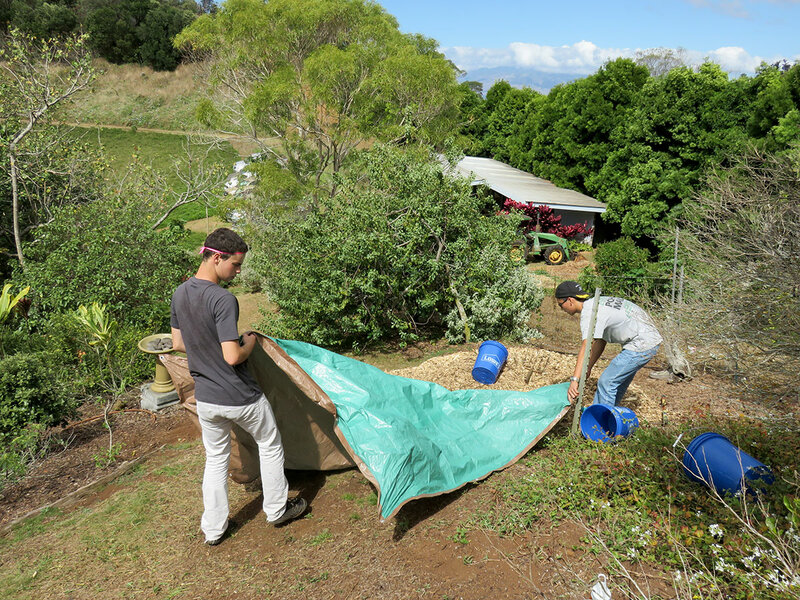 Every 3 days the trap is checked and baited with avocadoes. 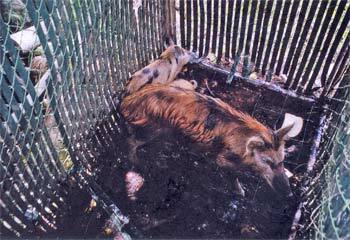 Since January 2006, 15 pigs have been humanely captured to be raised for Imu (Hawaiian barbecue). 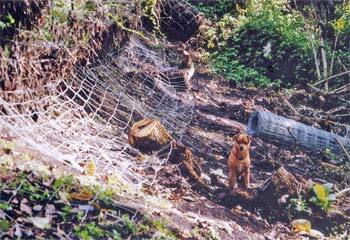 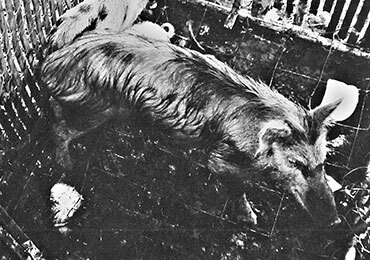 A sow and 3 piglets are caught in the trap above. 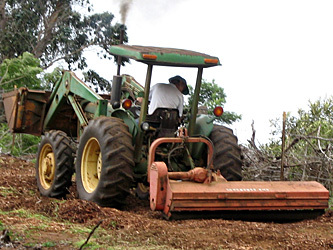 Mulch distribution is an ongoing job, redressing trees, expanding their mulch circumfrence and top-dressing new outplantings with the rich compost. 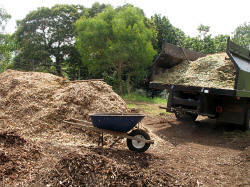 Mulch and initial distribution was financed by grants. 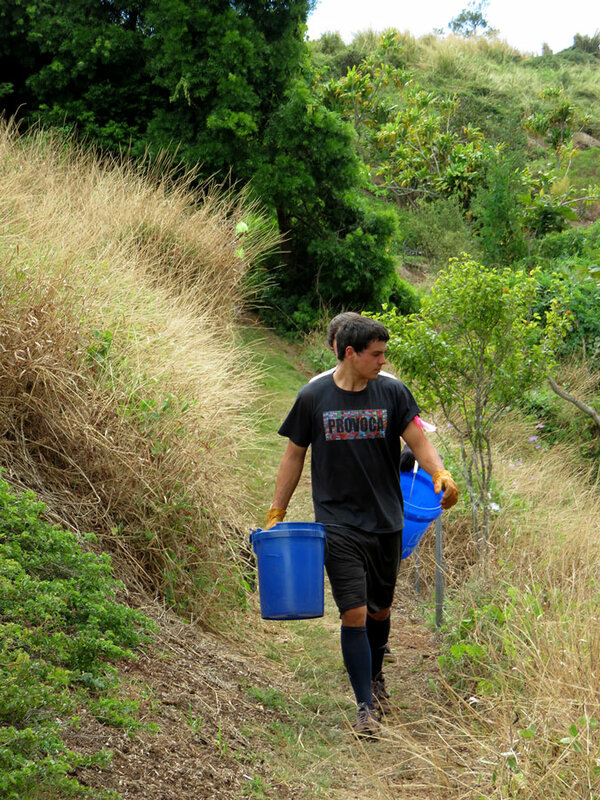 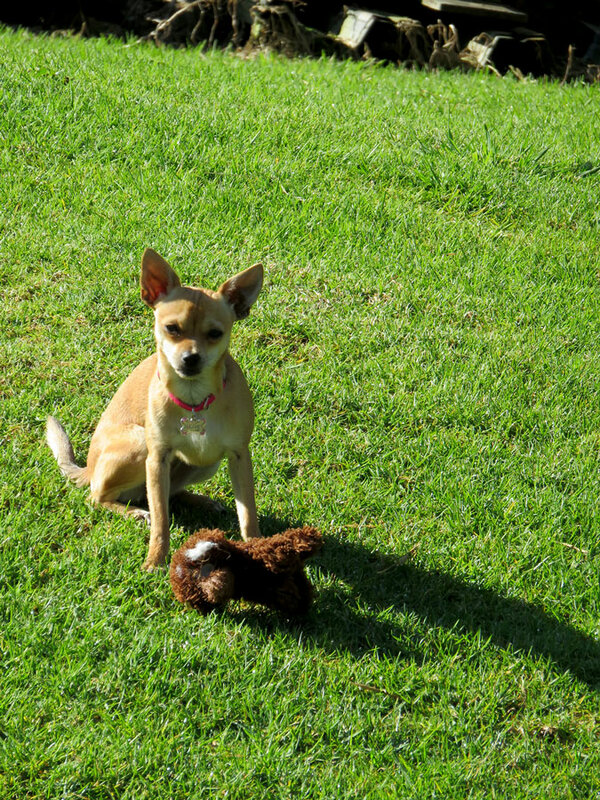 Ongoing distribution is paid for by individual donations. 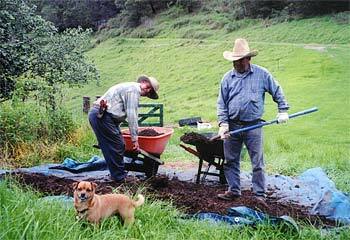 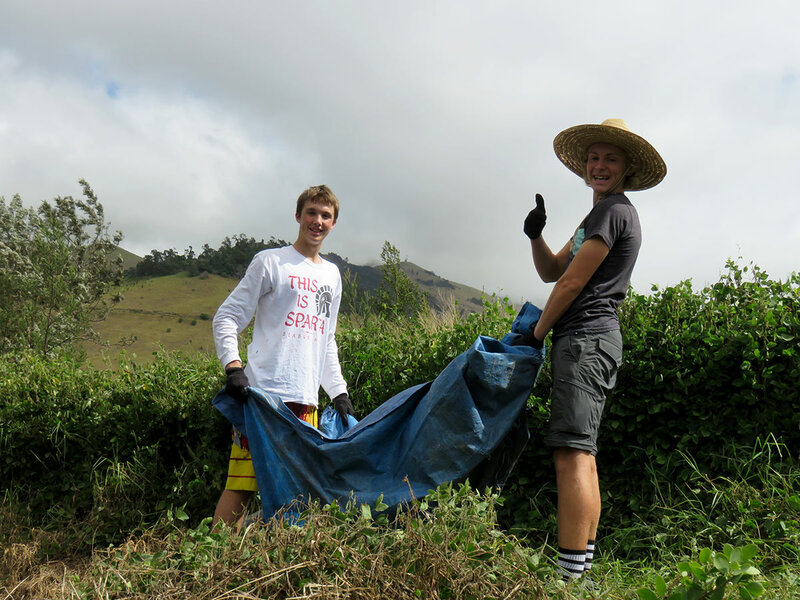 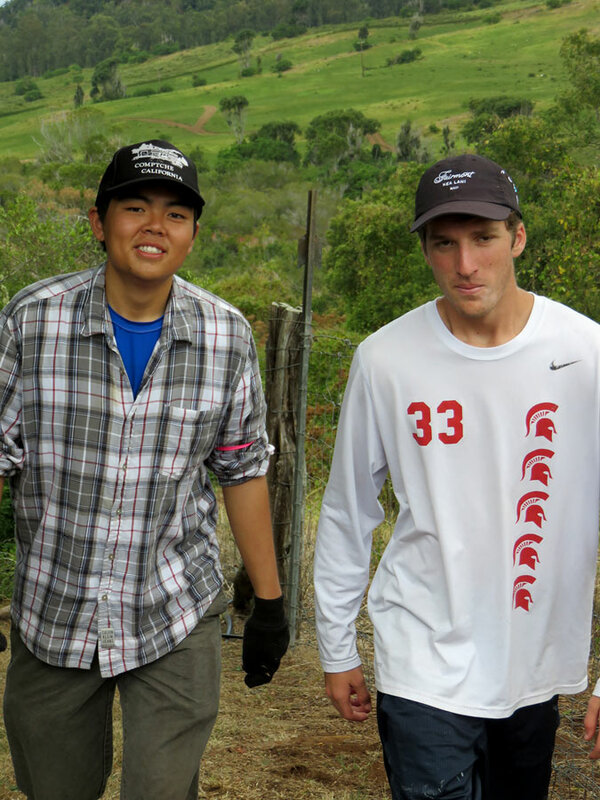 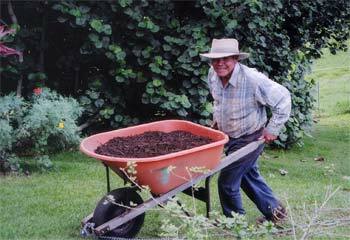 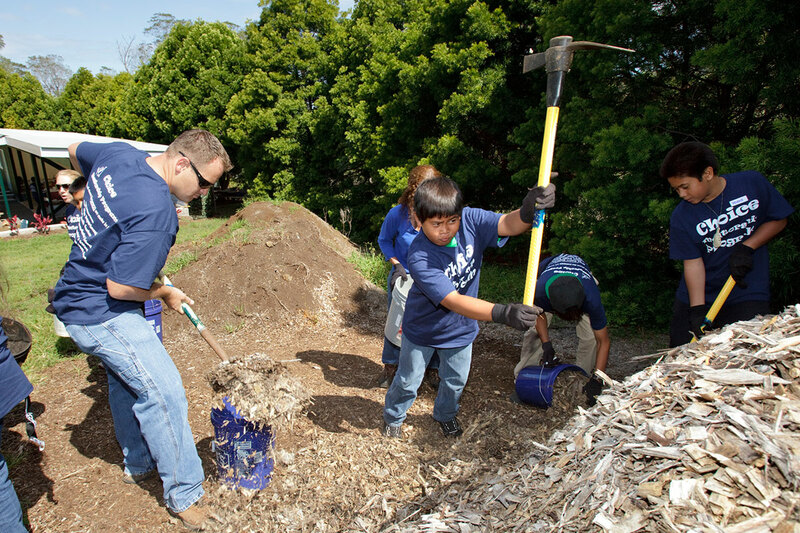 Francisco and Antonio Daiz distribute the rich mulch throughout the Arboretum. 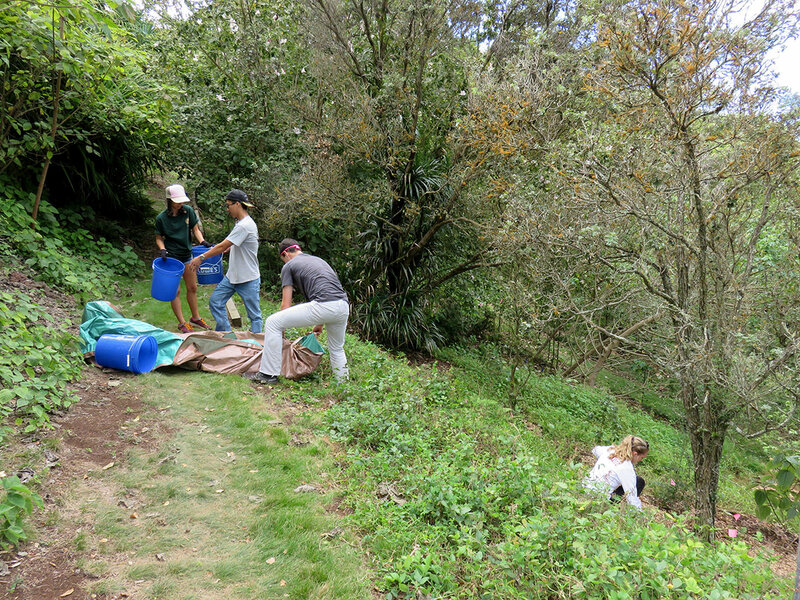 FOFA constantly works on acquiring new Auwahi species and greater populations of existing species for outplanting into the Arboretum. 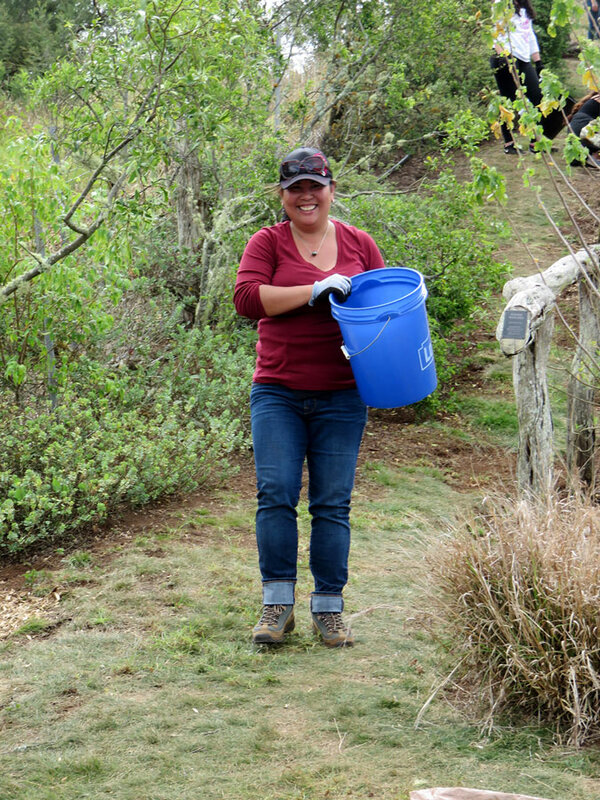 Our goal: for the Arboretum to be a strong seed bank for native dryland restoration efforts. 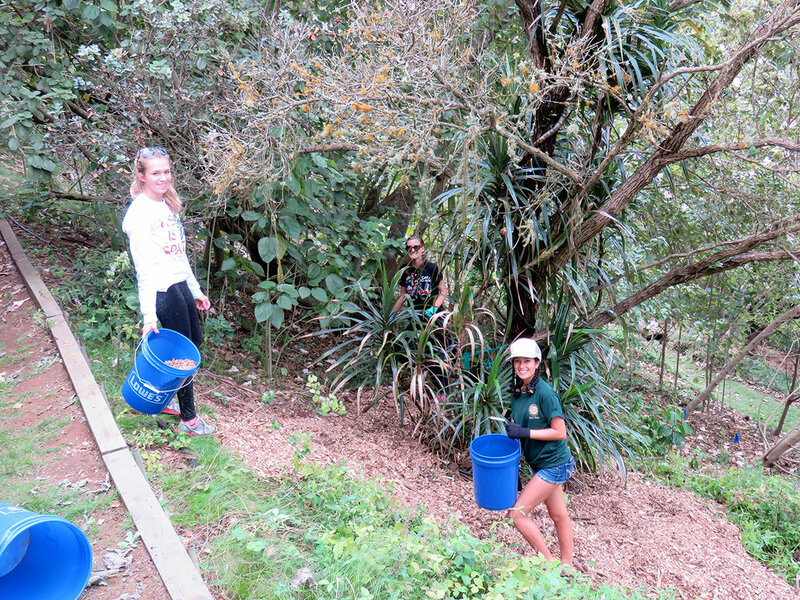 ‘Ie’ie (Freycinetia arborea) propagated by Noah Judson in Orchids of Olinda nusery. 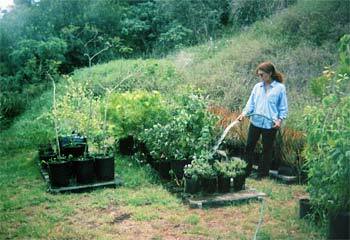 Martha Moran waters plants in the nursery, which is constantly expanding in preparation for a major outplanting in 2007. 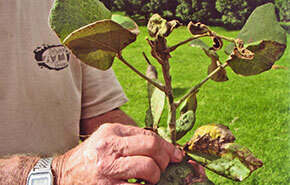 Evidence of the Erythrina Gall Wasp was discovered in the Fleming Arboretum. 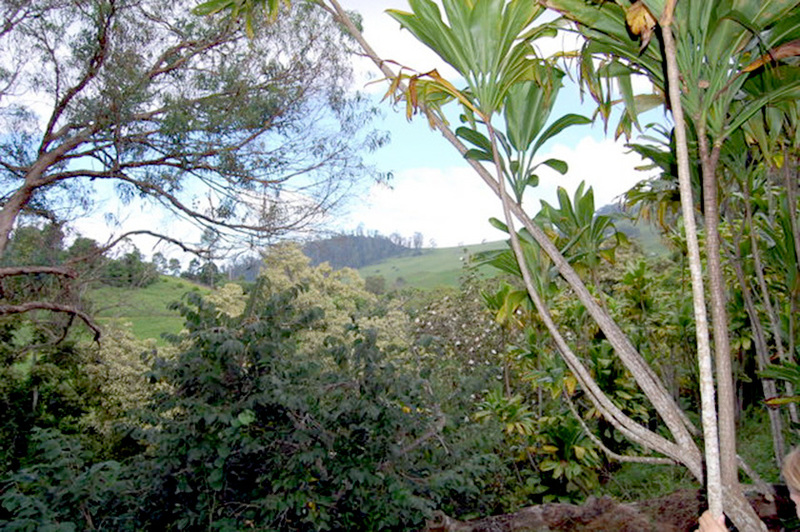 In January, 2006, Anna Palomino immediately responded at FOFA’s request to inject the trees with Merit, a systemic insceticide. 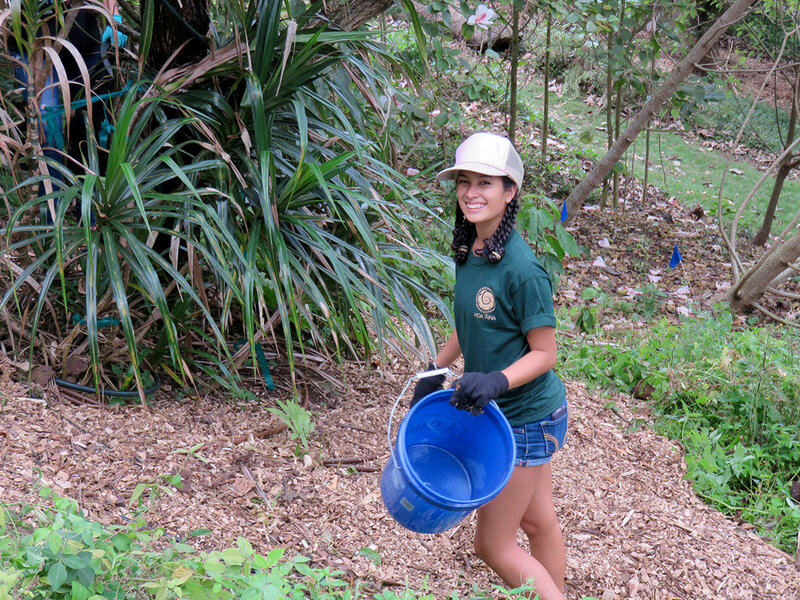 Anna has been contracted to provide this service to the Arboretum every 5 months. 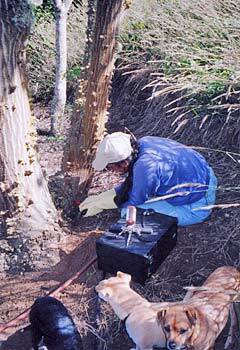 Above, Anna uses a special kit to inject the trees. 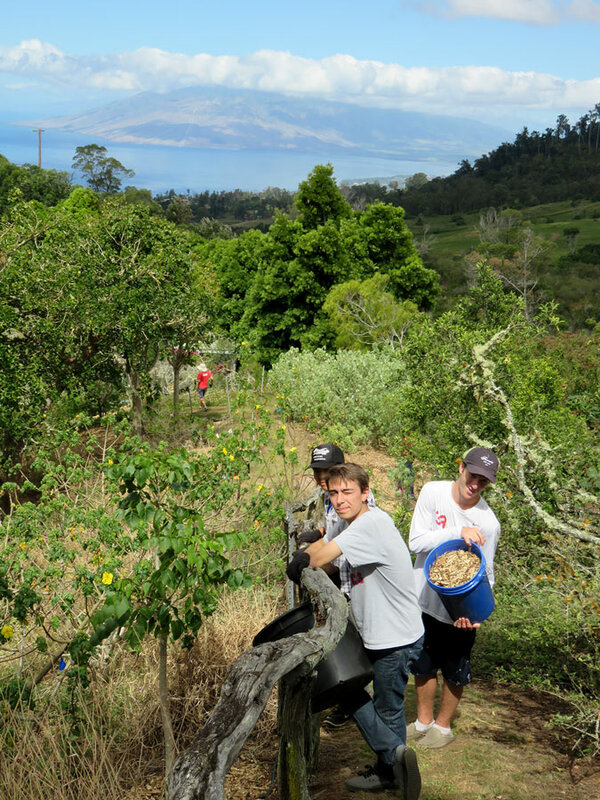 FOFA constantly works on seed distribution for reforestation projects and public & private outplantings. 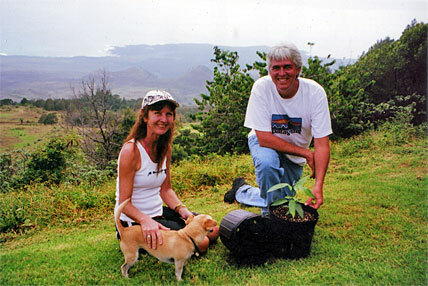 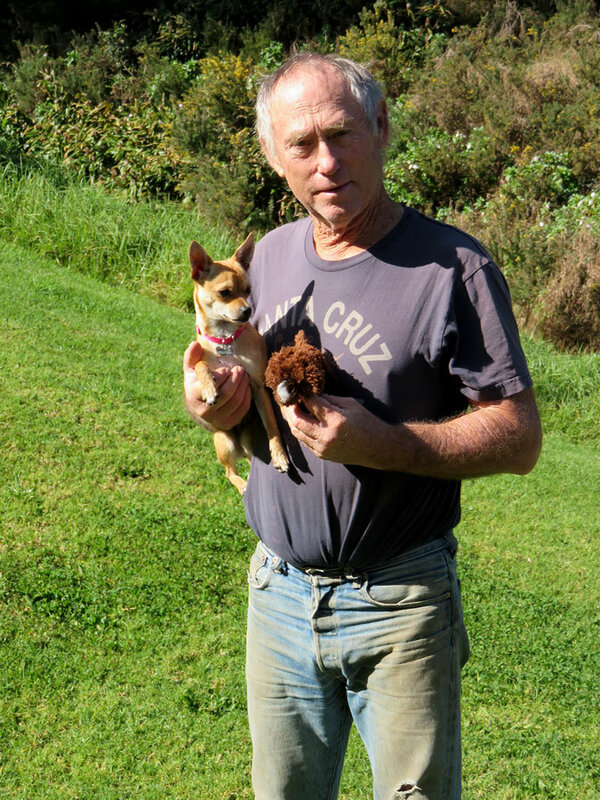 David Orr and friend Louise show off the young Alani from the Fleming Arboretum that will be outplanted in Waimea Arboretum on Oahu, enhancing their collection of native species. 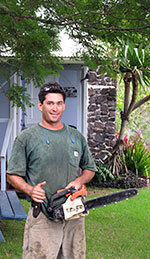 is fortunate to have his quality of work.